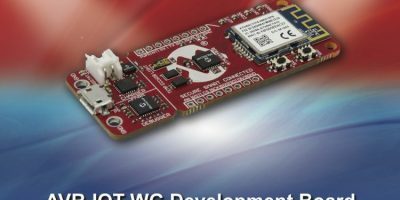 Win a Microchip AVR-IoT WG Development Board (AC164160) from Softei.com and make it easy to deploy IoT devices to Google Cloud IoT Core’s artificial intelligence and machine learning infrastructure. The AVR-IoT WG development board combines a powerful 8-bit ATmega4808 MCU, an ATECC608A CryptoAuthentication™ secure element IC and the fully certified ATWINC1510 Wi-Fi® network controller. The solution combines a powerful AVR microcontroller (MCU), a CryptoAuthentication secure element IC and a fully certified Wi-Fi network controller to provide a simple and effective way to connect embedded applications. The AVR-IoT WG Development Board gives developers the ability to add Google Cloud connectivity to new and existing projects with a single click using a free online portal at www.AVR-IoT.com. Once connected, developers can use Microchip’s rapid development tools, MPLAB® Code Configurator (MCC) and Atmel START, to develop and debug in the cloud. The board combines smart, connected and secure devices to enable designers to quickly connect IoT designs to the cloud. The board is compatible with more than 450 MikroElektronika Click boards™ that expand sensors and actuator options. For your chance to win the AVR- IoT WG development board (AC164160), visit http://page.microchip.com/Softei-AVR-IoT.html and enter your details in the online form.